I am now officially 31 weeks... and have at least 5 more before the girls are considered term and probably it would be best for them if they could go a week or 2 more than that... For the sake of not being able to move around well I kinda hope they come early, but for their sake I hope they stay in. I'm stuck! 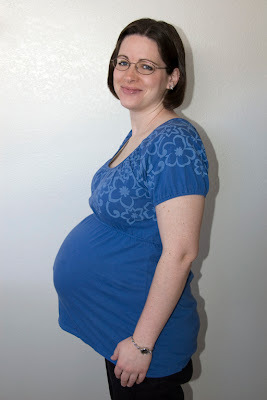 For a little frame of reference here's my 35 weeks picture with Noah. And yes, I wore the same shirt on purpose for comparison. And no, I don't know why I thought that much height was good for my hair, sheesh! At my last appointment (2 weeks ago) I was actually measuring 35 weeks and if these babies are growing at the normal rate they are just over 3 pounds... each! I'll get another ultrasound on Friday so we'll see if they are still measuring each as a singleton or if they've slowed down 'cuz they're getting kinda cramped in there! On the home front I've got the newborn clothes all washed and in the dresser, just waiting for some wall decorations to come in the mail so we can put them up and then the crib in place of Brian's desk. I've gotten a ton of little projects done in the last week and aim to do a bit more organizing and purging. I think the nesting has set in! Krista- I think you look great! I hope things get easier, but couldn't imagine how uncomfortable you are right now. I will pray that the next few weeks go by fast. I love the comparison pictures between this pregnancy and others. So glad you are having a healthy twin pregnancy!